A hard to find near the end of the line issue of METRONOME from July 1960 that includes the by far rarer Newsletter insert. That insert covers the merger of the Black & White Musicians Union Locals in Denver, Colorado as well as a fascinating challenge to Lincoln Center, soon to open, on why no Jazz was planned. 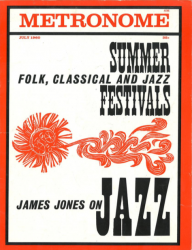 The magazine itself covers the expansion of summer festivals and has a Jazz overview by “From Here To Eternity” author, JAMES JONES. There is also overview concerning Metronome’s 89 years.